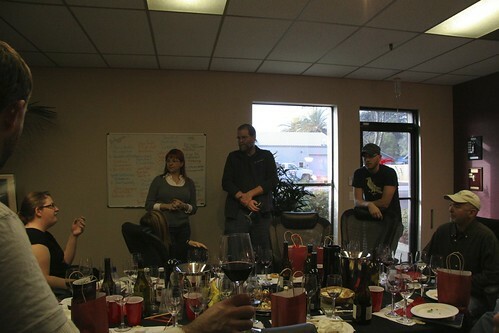 On December 7, Wine Mutineer Alan Kropf stopped by the Hahn Estates sales office in Napa, CA to participate in a session about wineries and bloggers collaborating. Cheers to the fine people at Hahn Estates for putting this on. In addition to Hahn’s new media guru Lisa de Bruin attending this session, Hahn President William Leigon, Winemaker Adam LaZarre, Director of Vineyard Operations Andy Mitchell, VP of Sales Evelyn Pool, and Lisa Adams-Walter from Public Relations also attended. The event was an opportunity for wineries and bloggers to get together and chat about possible avenues of collaboration, with this goal being realized in some intense discussions about blogger credibility, conflicts of interest, and how to improve blogging as an overall medium. I realize that this is probably of little interest to the casual drinker, but I have chosen to post about this to spotlight behind the scenes efforts being made to evolve and improve the world of wine blogging, which I think is most certainly of interest to the casual drinker. Hahn Estates is a world class producer of wine, and the blogging community is fortunate to have them as an ally. If you attended and are not included on this list, email jeff@mutineermagazine.com and we’ll add you. I had Hahn recently, I really like the Pinot. I think this is a great idea. I’m going to see if I can do something similar in Pennsylvania. There is great potential for bloggers and wineries to work together to promote each other. Thanks for posting this article. It is exciting to be on the forefront of the conversations happening in the wine world now about wine, social media, online networking, marketing etc. And like Randy Pausch demonstrated in his Last Lecture, the front runner often ends up with a quiver of arrows in their back. Thanks for the appreciation and encouragement. It is, ultimately for the bloggers, consumers and the evolving media industry that drives me forward with enthusiasm and curiosity. All of us share an unconditional love for all things wine and it is a thrill to enlarge that circle every day. It was a great affair and we were so happy to be part of it.